Day Two begins with a full Irish Breakfast. To most Americans this might sound like a must have after a night of Dublin pub crawling. However, pre-fried sunny-side up eggs, Heinz Baked Beans, brown pudding, white pudding, soggy Canadian bacon, pre-toasted white bread, stewed tomatoes, and under-cooked bangers is enough to make the stoutest of stomachs convulse into a near volcanic eruption. Lunch was much better; smoked salmon on whole grain bread with onions. Dinner takes the cake, so to speak, as we dined Italian. A thin pizza topped with marinara sauce, mushrooms, artichoke hearts, ham, and eggs! Really delisioso. Also, we share pasta taggliani with a mushroom and butter sauce. The Salad was nice too; greens, sun-dries tomatoes, capers, olives, balsamic vinegar and olive oil. Other highlights of the day included a forced march to Grafton Street. This is the Rodeo Drive of Dublin. we visited the National Museum and saw a lot of really old stuff. I learned that Ireland stayed neutral in WWII. Smart folks. 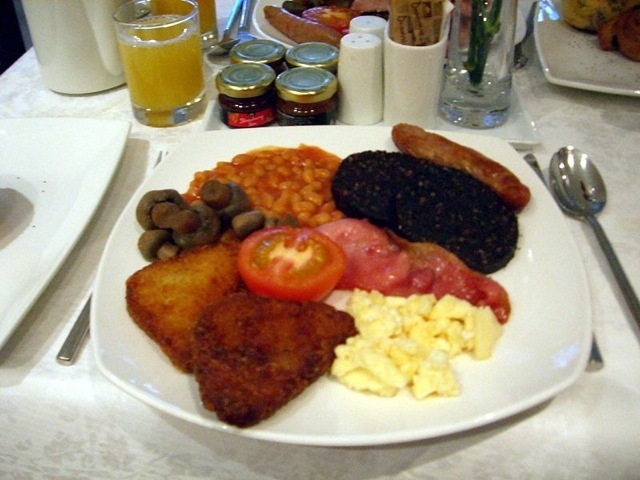 Posted by pubspeopleplaces on September 24, 2011 in PLACES and tagged abroad, Ireland, Irish breakfast, National Museum, pubs, travel.